Pollution and Religion in Ancient Rome. Jack J. Lennon. New York: Cambridge University Press, 2014. 229 pages. in the Ancient Mediterranean World. In many societies, concepts of social order have been shaped considerably by notions of purity and pollution. 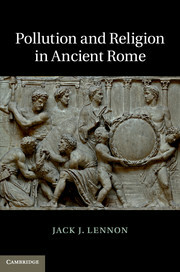 According to scholar Jack J. Lennon, anthropologists have given discourses of pollution and purity more attention in recent years, yet, prior to this volume, there had been no comprehensive treatment of the subject in the world of Ancient Rome. It is this gaping hole in anthropological knowledge that Lennon wishes to fill with his book, which “explores the presence and perception of pollution in pre-Christian Roman religion” with a primary focus on the “ways in which Roman authors imagined, expressed and ultimately reacted to, things they thought were impure” (IX). Beginning with a thorough discussion of Latin lexicons of purity and its other, Lennon proceeds to show how various understandings and the regulation of bodily functions and effluvia are mediated through and by discursive elements. He concludes by honing in on Cicero’s speech De Domo Sua to further elucidate the connection between lexicons, the body, social order, and rhetoric in Ancient Rome.